Alessandro Sanchez in José Casas’s jj’s arcade, produced by ZACH Theatre with Teatro Vivo, through May 7 at Mexican American Cultural Center. 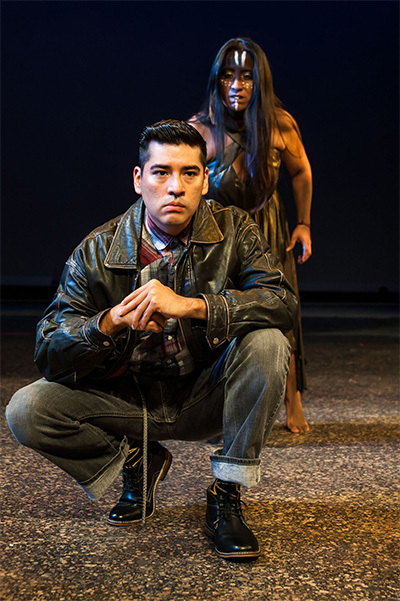 Ivan Jasso as Gusty and Stefanie Tovar as Raya in the Cara Mia Theatre Co. production of Caridad Svich’s De Troya, through May 14. Photo by Linda Blase. What do we mean when we talk about Latina/o theater in Texas? This was the question I kept pondering at the beginning of yet another one of the wandering/mapping jaunts I occasionally take when I find myself yearning to exploring more Texas theater. Giving myself permission to meander instead of attempting to do a data-driven census, but with a goal of trying to assess the state of Latina/o theater in Texas, I found I couldn’t get very far without answering that first basic question. So I began my journey by consulting a previous guide, the theater blog Howlround’s series on Latina/o Theater in Texas, and then a few experts: first, Dr. Trevor Boffone, who teaches in the Department of Hispanic Studies at the University of Houston and is the founder of the 50 Playwrights Project: A Digital Space for Latin@ Theatre. “Most people will say a Latina/o play is a play written by a Latina/a, a person who identifies as Latina/o,” explained Boffone; but he would also include some works by non-Latina/o playwrights that tell authentic Latina/o stories. As the term Latina/o “would only refer to people based in the U.S or with a meaningful relationship with the U.S,” says Boffone, of the agreed upon textbook definition of the term, it led me to a fundamental guiding principle to begin my exploration, that Latina/o theater is US-based theater, and so the question becomes, how are we treating this strand of U.S arts in a state where a third of the population is Hispanic? I found that the answer in many ways depends on where one looks. Many cities in Texas with vibrant theater communities have non-Latina/o companies regularly producing contemporary Latina/o playwrights or plays that tell those stories. 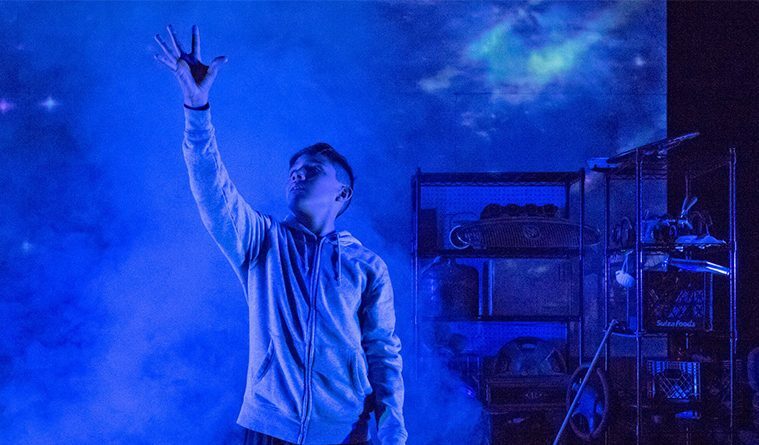 Dallas Theater Center, Stages Repertory Theatre in Houston and ZACH Theatre in Austin, to name just a few, usually have at least one play or musical in their season lineup by a Latina/o playwright or at the very least produce a play that tells their stories. 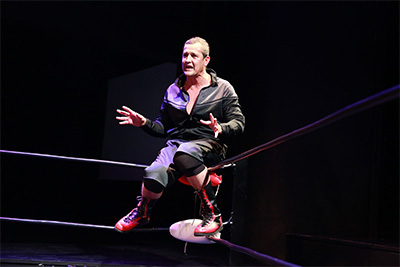 Luis Galindo in the Stages Repertory Theatre production of The Elaborate Entrance of Chad Deity. Photo by Jon Shapley. But while we partake of Kristoffer Diaz’s The Elaborate Entrance of Chad Deity, Matthew Lopez’s The Whipping Man, Nilo Cruz’s Anna In The Tropics, Quiara Alegría Hudes’s Water by the Spoonful or Lin-Manuel Miranda’s In the Heights at our favorite Texas professional regional theater, we probably shouldn’t grow complacent while we wait for everyone’s theatrical hero, Hamilton to dance into Houston in 2018. Because if we’re valuing Latina/o playwrights and stories, should not we also value and nurture Latina/o theater companies? At this company level all cities’ theater communities do not look alike. Along with community and smaller professional theaters, some presenting in Spanish sometimes for immigrant audiences, a few cities have a least one Latina/o theater producing several plays per season. A good example would be Austin’s Teatro Vivo, which produces bilingual theater at Emma S. Barrientos—Mexican American Cultural Center. In addition to collaborating with ZACH Theatre on plays for youth, Teatro Vivo also presents the annual Austin Latino New Play Festival. However, when looking at the whole state, Dallas shines brightest, with not just Cara Mía, but several more companies producing work in English or Spanish, and often catering to distinct audiences. 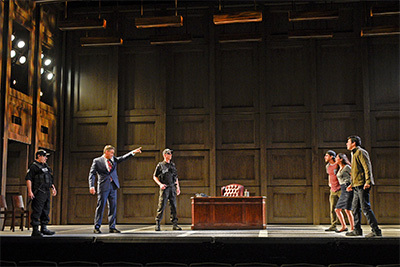 The Cast of Deferred Action by David Lozano and Lee Trull, produced by Cara Mia Theater Co. with Dallas Theater Center, 2016. Photo by Karen Almond. Dallas’s Cambalache Teatro en Español and Teatro Flor Candela both present in Spanish, while the oldest company, Teatro Dallas, founded in 1985, produces international theater through the Latina/o experience with some work in English and some in Spanish with English librettos. “One could say Dallas is actually thriving in terms of Latina/o Theaters,” Lozano continues, who also feels their success needs to be put into context and perhaps compared with those midsize non-Latina/o theaters throughout the state. 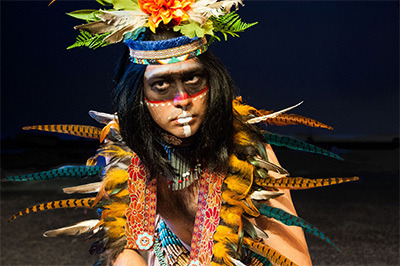 Ivan Jasso as the Deer in the Cara Mia Theatre CO. production of Caridad Svich’s De Troya. Photo by Linda Blase. While applauding all those productions of Latina/o playwrights we can regularly, or occasionally depending on the city, find in Austin, Houston, San Antonio and his own Dallas, Lozano also sees some drawbacks for Latina/o theater companies. Lozano worries about companies getting an equal share of both funding and talent, and speaks with worry about the talent pipeline that begins with budding young Latina/o artists. “Are they receiving the same access to the arts at an early age and are they able to stay with the arts through high school, college and beyond? The pipeline is a real issue, and it’s racially divided,” Lozano warns. One of those major cites is also the fourth largest city in the United States. Houston possess its own thriving theater community and companies that produce Latina/o playwrights fairly regularly, yet there is no Latina/o theater company. (Houston’s Gente de Teatro produces Spanish language plays.) Organizations such as Talento Bilingüe de Houston, that in the past presented performances for adults, and MECA (Multicultural Education and Counseling Through the Arts), which presents and works with theatrical and multi-discipline artists of color, have objectives and missions that are somewhat different from a traditional theater company’s. 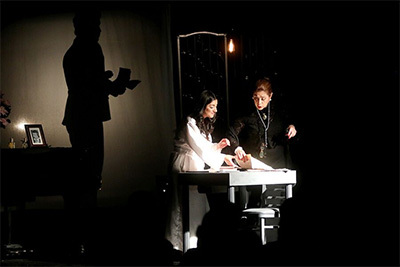 Vanessa Alanis and Angela Martínez, Rogelio Carrizales in El sueño de la razon produce monstruos by Angeles Romero (2016) at MECA Houston. Photo by Pin Lim. Sometimes that sense goes internationally for MECA, as they will become one of the presenting partners when the Alley Theatre brings Misa Fronteriza, a comedy created by two theater companies based in Monterrey, Mexico, to Houston in 2018. When deciding to present theater, Azcona must decide if the artist will be relevant to the community and the social and cultural issues important in Houston at any given time as well. When I asked Azcona about Lozano’s concerns about equity in funding, he was thoughtful. “Most of my experience on that side of things has been within the Latina/o sector, but I do know from looking at the numbers that the larger support that’s out there has not trickled down to Latina/o artists and organizations, so you don’t see that support in those areas, the initiatives to ensure that equability,” says Azcona. These issues of funding and the pipeline tie into another problem that Boffone sees of the Texas theatrical territory for Latina/o artists, that Texas produces great stage artists, actors and playwright, but then they find they must leave in order to continue to create. “The artists don’t necessarily want to leave Texas, but they feel like they have to leave at a certain point. All of the ones I know still have a strong connection with Texas, but they aren’t necessarily wanting to come back because they can’t do the stuff they do in Texas,” describes Boffone. With an eye on keeping Latina/o artists in Texas, Boffone has become the associate producer of Sin Muros, the just-announced Latina/o Play Festival at Stages in Houston. While Stages is one of those companies that has consistently produced a Latina/o play a season, Stages artistic director, Kenn McLaughlin wanted to do more, explained Boffone.